“Country boys make good in the big city”. That short sentence could very easily summarize the story of Charlotte, North Carolina’s ANIMAL BAG. 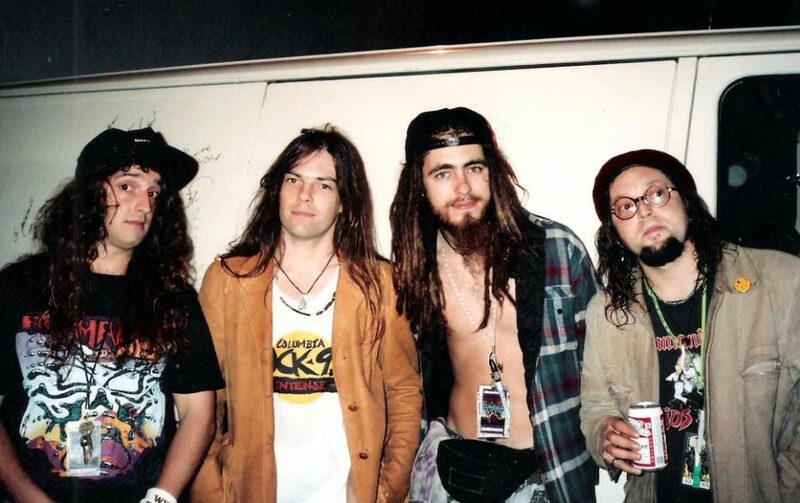 After some earlier membership changes in the years prior, 1987 saw ANIMAL BAG stabilize with the line up of vocalist / guitarist Luke Edwards, guitarist / vocalist Rich Parris, bassist Otis Hughes and drummer Boo Duckworth. For the next two years they spent time building a loyal fan base in The Queen City region. The band’s alternative metal styling was one that incorporated funk, southern rock, and more into their own energetic sound. In 1989, ANIMAL BAG relocated to Los Angeles and quickly began to garner attention and favorable press. Drawing comparisons to such acts as Faith No More and Red Hot Chili Peppers, ANIMAL BAG were soon being courted by several record label A&R execs, eventually signing with Polygram Entertainment‘s Mercury Records in 1992. That same year, the band would release a self-titled début album that mixed their eclectic style of alt. metal and grunge with acoustic rock. The album’s first single, “Everybody“, landed on the Billboard Mainstream Rock chart at No. 29 in 1993, and was also a minor hit in Japan. The song’s subsequent video received regular airplay on MTV’s Headbanger’s Ball at the time, while ANIMAL BAG appeared in the pilot episode of My So-Called Life as “the party band”. Luke: “‘Offering’ was originally intended to be a give-away to bolster sales in the first release. Bob Skoro, president of Polygram when we were signed, heard us play an acoustic set at a pool party for record label employees. He loved the acoustic stuff so much he wanted us to go in and record an acoustic EP to be packaged as a limited give-away with the first CD. Can a band be too great for their own good? Some might say “yes” based on what happened with ANIMAL BAG after the release of the ‘Offering‘ EP. The third ANIMAL BAG album that Luke mentions here saw Mercury deciding to enlist the guidance of well-known producer Terry Date (Pantera, Overkill, Slayer). He was brought in to get harder-edged results on the third recording, and in that regard the move was quite successful as the band’s third record was immensely heavier in its contents. However, when all was said, sung, played, and done, ANIMAL BAG‘s third studio album, “Image Damage“, would be unreleased and shelved at the time. The move occurred due to internal shake ups at Mercury that resulted in most of the band’s supporters there to leave the label, including Skoro’s exit that Luke mentioned above. Thankfully, the album has surfaced online in the years since and contains some of ANIMAL BAG‘s hardest hitting, and definitely more experimental, music of their career. By 1998, an EP, ‘Misc Recordings’, containing some unreleased songs and rarities, was released, though ANIMAL BAG had already disbanded. Singer Luke Edwards went on to form the bluegrass band Tater, and now remains active in The Grassabillies, while drummer Boo Duckworth would later resurface in the well-known southern rock band Gideon Smith & The Dixie Damned. Boo Duckworth died from natural causes at age 35 in 2002, while lead guitarist Richard Parris followed him, passing in 2010 from complications related to a ruptured ulcer. Parris had just recorded an album with his band M4 Messenger, in which ANIMAL BAG bassist Otis Hughes was also a member. The story, and ultimately the legacy, of North Carolina’s ANIMAL BAG, is a remarkable one. Those of us from rural locales surrounding North Carolina were ecstatic supporters of the band and have fond memories of their all-too brief existence. Yes, the ANIMAL BAG story is indeed one of “Country boys make good in the big city”, and one I am happy to share with you here today. My pleasure and Thank You, Luke, (Rich, Otis, and Boo, as well) for being ANIMAL BAG, and giving us such great music and memories in the process.